Through what was the longest release phase for any boot ever, New Balance teased the market for 12 long months before they were introduced their debut line-up. There was a lot of hype through that period! Finally the Visaro and Furon arrived this Summer and they created a lot of intrigue. From initial interaction with both release boots, one thing became evidently clear; the New Balance Visaro has a lot more on offer for players than the Furon. So much so that this is the only NB review we initially plan to feature – we will explain that more down below. Built in a sort of Hypervenom mold, thie Visaro is a boot built for players that want to create and make chances, and that is where our focus lies right now. How does it all play out on pitch and do they live up to the hype? Questions to be answered….. If you are interested in the Visaro, find them listed at soccer.com. 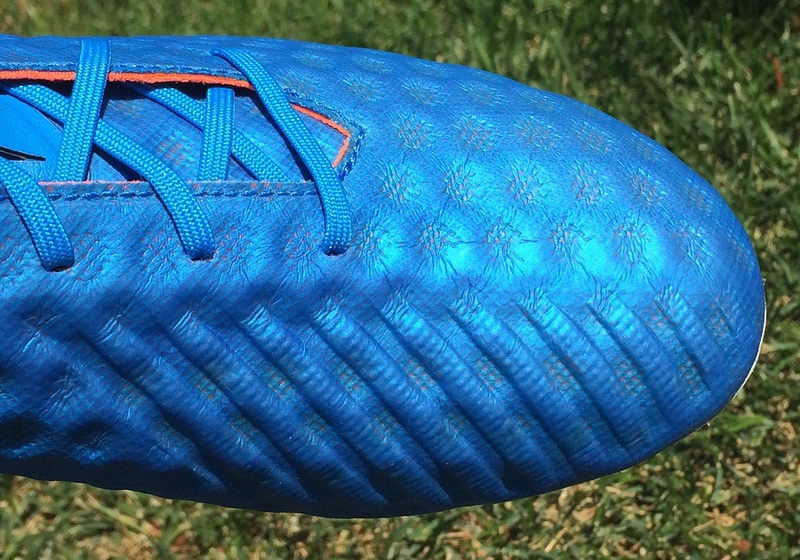 This is a boot with that almost has a combined Hypervenom mixed with CTR360 Maestri feel about it. Right through the upper there is full on definition, and it’s role in the performance of the boot is going to be interesting to figure out. Visually, they look really sweet. When you mix that with the amount of marketing and build up the Visaro received over the past 12 months, it puts heavy expectations on the range. Before discussing comfort, it is important to breakdown the upper the New Balance use. It is officially called an Ariaprene synthetic. Through the forefoot, it has a 4mm cut with a 2mm in the areas where the material “sinks in”. This is essentially the embossed dots that cover the upper. Visually, it looks like a mesh covered by a deeper layered panel, almost like it was melted on. Along the strikezone, things are just a little different. A series of vertical stacks are added through the region, providing even deeper grooved texturing. It is labeled as the Vari-Zone, and its role is to improve ball manipulation. To the general touch, the upper material has a buttery soft feel. It almost feels like a leather. But, as you bend it you will notice there is a much stiffer feel that you would generally expect from a synthetic. What that means is you will need to wear these a few times to really break the upper down and get them moving in a more unison fashion with your foot. They have a tight feel from day 1 and it is the type of boot you need to break in over a few sessions rather than taking them into game right out of the box. There are positives to take from this boot, including the suede like inner lining that holds your foot firmly in place. I’m a big fan of this. 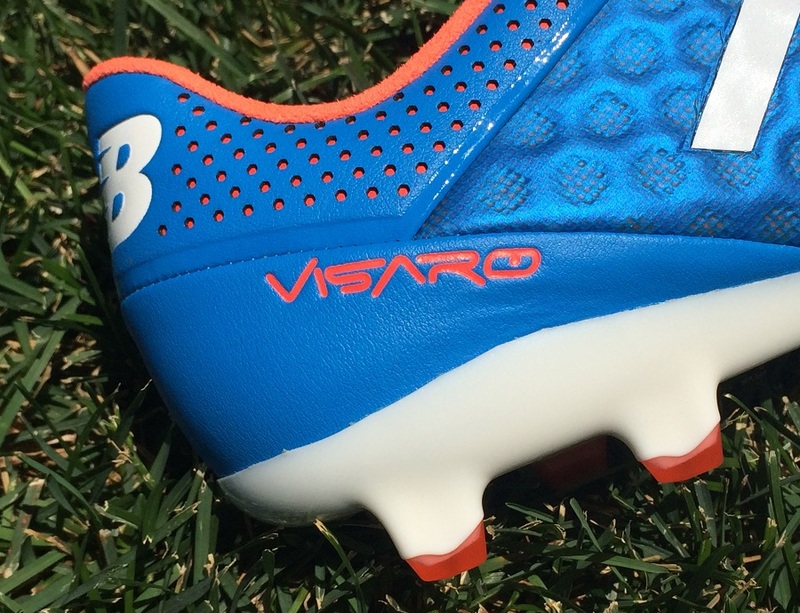 But, comfort wise I was left wanting more from the Visaro, most notably in the general feel of the upper material. Something else important to note is that the insole is glued in place, so it is not removable. It is a pretty impressive insole with plenty of spring and a very comfortable feel. You also get the positive of knowing it won’t move right through wear. But, if you use an insert, make sure to keep this in mind. You will essentially be placing personal insert on a padded insole, resulting in what will be a tighter fit right across the upper. Flip the boot over and you will find a very clean, yet advanced Super-Flex soleplate in play. A smooth white base is covered with a balanced layer of triangular style studs and a red area called the Medial Pivot Zone that sits right under the big toe joint. The latter is in place to provide a quick pivot and faster acceleration as players turn with or without the ball. Four conical studs cover the region and it is a noticeable component through play. Basically, the stud positioning coupled with an altered plate increases the speed your foot hits and releases from the surface. Designed as an FG boot, that is where they are at their optimal best but don’t rule out using these on AG. The low profile setup ensures they will also be very proficient when you are playing on turf. In terms of general performance, that pro-last form and soleplates offers a flexible feel through play. This is not an easy boot to bend for the first time, they have some serious spring back. Think of these as holding a more Umbro Speciali like soleplate as opposed to a Puma evoPOWER. Through the midfoot, a strong spine is in place to provide additional support. With that ridged construction in place across the strikezone, it is important to offer thoughts on how they feel striking the ball. To the touch, there is obviously enough material to reduce impact and provide a padded feel. For a boot that weighs in at 7.7oz, that is awfully impressive! I found that in game, you do get a solid feel on the ball with clean connection. Adding such high texturing in a prime area also ensures you have the potential to really get solid spin. NB are using the natural construction of the material for this rather than implementing outside elements and that gives the boot a uniqueness. If you are a player interested in the Visaro and wondering if it is enough of a draw to splash out on a pair, I’d say go for it! This is not a boot that is Predatoresque, but it does provide performance along the lines of the CTR360 and that should be enough! One other note related to control. Right along the instep, New Balance has included a low pressure zone, where the material is softer and a little more giving. This is quite the opposite of the CTR360 in terms of specific area performance, but it does encourage a clean and gentle first touch. In general, this is a true to size fitting boots that is very much on par with the market. They do, however, have a slight Puma V-series feel about them with the region around the little toe dipping in at an angle toward the big toe. That is something to watch out for if you like extra space toward the outside of a boot. Starting out, they do feel very snug but as you wear them and the Ariaprene synthetic upper material molds, you get a much more natural fit. The nice thing about the upper is it doesn’t overstretch, so you are left with a very secure fitting boot. We know that New Balance took over Warrior Sports, but what does that mean in terms of boots and the type released to market? Realistically, it should only be a minor rebrand with NB finding areas where Warrior might have shown weakness. Warrior actually did a very decent job during their short time on the market. Although they didn’t break into the upper echelons of sales, they did leave players considering their boots and talking about them. While stepping in, NB should have considered that, looked at numbers and tweaked what was needed. That is the theory of it anyway. Instead, they took the David Moyes route and completely changed up the market offering. Where there are positives to offer with the Visaro, the Furon is an absolute disaster of a boot. It is one of those releases that leaves you scratching your head wondering how it made it to market – especially through a year long release phase. Since its release, players have quickly drifted away from the boot (for example Adnan Januzaj) and being honest, we see them destined for bargain bins. That leaves us with the Visaro, and as I’ve pointed out, there are positives to work with here. We have already seen some of the next generation prototypes that are in testing and we anticipate a much improved end product. I’m a little disappointed that there was so much hype put into the New Balance series of releases, with huge potential in what the end product could offer. It hasn’t panned out. The Visaro is a boot worth considering, but it is not a must have release. On future editions, it will be about getting the shape and upper material right. A more natural feeling material is definitely top of the list! If you want to see more of the Visaro and available colorways, find them at soccer.com. 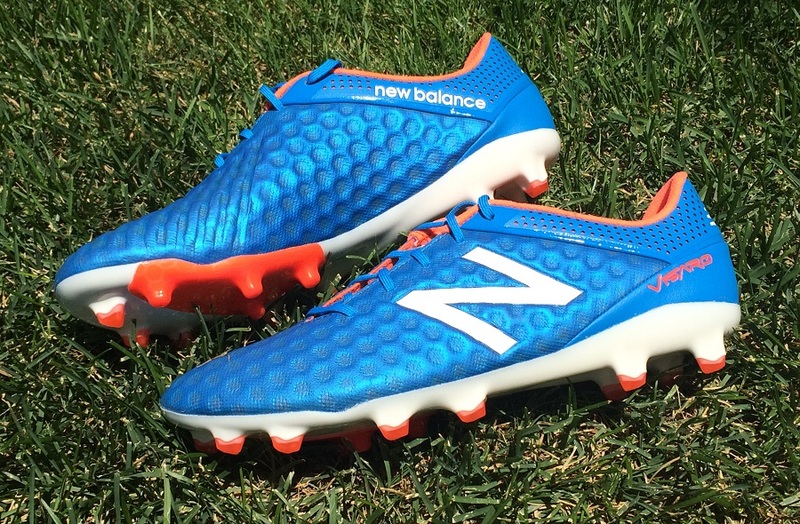 Highlight: A fresh market option from New Balance, designed to offer players creative freedom. A heavily textured upper provides increased cushion and control on the ball. Category: Fall right into the Control category. Would I Buy Them: They are one to consider, especially on sale. But there is nothing special about them that sets them apart as a must have. Player Position: In general, they are going to be suited better to attack minded players that like to get on the ball and create. But they also have enough padding through the forefoot to be a useful defensive boot. 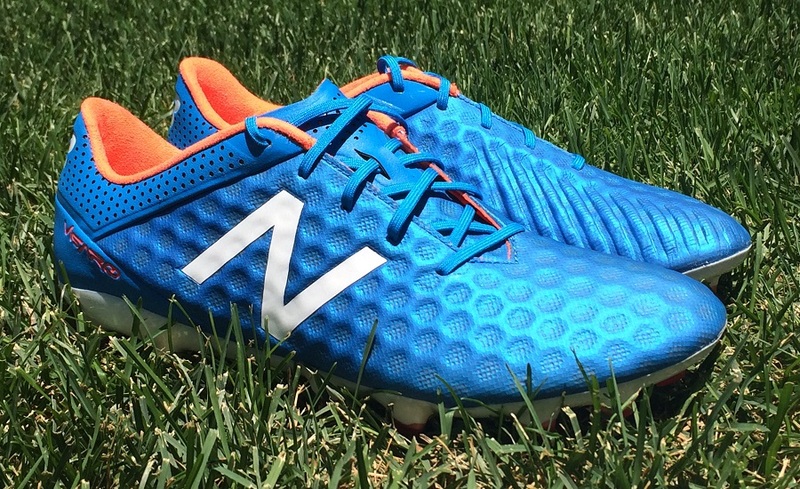 A fresh market option from New Balance, designed to offer players creative freedom. A heavily textured upper offers increased cushion and control on the ball. Properly. Chanced the Visaro. Never made a better choice in boots. Same width sole plate, he said more comfortable as hugs his foot better and with increased comfort, sole liner better for his severs, overall he is stoked! Surprised him also. Touch is great and traction just as good as vapors. Look better in person. Just wanted to share! I own them for 3 weeks now. Must say that I'm impressed with the touch and passing performance. Kicking and passing are smooth. I love em when I need to pass the long ball. They are pretty much accurate and powerful. I need less energy than when I wore adizero. However, I kinda worried with the studs. Those are samewith my 1st gen adizero. The studs peeled off after some times. I also don't feel that the studs help my acceleration unlike Vapor's. Having play in firm grassy field I still opt for Vapor and X Chaos. Are they worth to buy? If you don't care bout traction and not that kinda need for speed player, I say they are a must have boots. Tried so hard to like these and conform to the new movement toward synthetic materials, but it's just not working. Lightest boot I've ever worn, but with that comes a huge sacrifice in comfort. I'll keep trying to "break them in," but they're definitely the first and last synthetic boot for me. Sticking with the K-leather classics….. The good thing is that they are listening to feedback and modifying the design on future releases! Initially the toe box felt too low & squeezed my toes, but after a few uses it was fine. Major problem was losing a some traction as the studs are short & rounded on the edges. I notice you were not impressed with the Furon. Did you get the right size? Just got the original Furon Pro & followed the official NB website recommendation to go up in size which I believe most Furon reviewers did not. My normal size pinched my foot when trying in store, but half a size up was perfect & super comfy right into a 1 hour game no break in needed. The Furons performed fantastic, better than Visaros, a better version of the Adidas F50 in my opinion.